Sunday--It was in the mid-nineties. My friend Rachel and I must be fortune tellers. We put Sunday, July 17th on the calendar two months ago as the day that we were going to go to Michigan Adventure Water Park. We hoped for good weather. Who would have known we'd get the best weather ever to play in the water all day? It was perfect. I don't think I saw one tooth chatter all day. No one wanted to get out of the water. While there I learned to be very thankful for eight things I don't frequently think about (well...except for the last one--you'll see). But baby--I'm super thankful for these things! 1. I do not sport a tattoo on any of the following locations; my neck, down the entire length of my leg, coming out of the top of my bikini bottom (really ladies, really? ), across my stomach, around my belly button, a trail of thorny roses that starts on my chest and wraps around my waist/down my thigh and ends on my feet,down the entire back of my leg, or anywhere that's been stretched out by a baby. 2. For swim diapers. I mean sure....they're great....I've always acknowledged that....but..........Georgia went through three of them in about one hour (know what I mean?). 3. For chlorine (see #2)....and loads of it. I asked Chris what percentage of the water flowing through that water park (and there are thousands of gallons of water) was urine--his guess was the high twenties. Ah....the eternal optimist--it's why I love him. 4. I'm not these ladies. Yikes. Way too hot, way too much water, and way too many clothes. 5. For my Vera Bradley duffel bag. I have never been a huge Vera fan--my sister however, bleeds the stuff. But they came out with a new pattern this spring that I liked and my mom bought me a duffel bag. This thing holds so much stuff and is so light to carry. I shoved a change of clothes for all of us in there, three beach towels, water bottles, sun screen, my camera, snacks, diapers, wipes, shoes, and hats. I could have fit all of that in there again. If you're looking for a bag that you can put insane amounts of stuff in and still carry without wheezing--invest in one of these. 6. For parking lot picnics. Sure....Chris and I like paying $8.99 for a small fry but sometimes it's nice to be allowed re-entry into the park so you can leave for a bit and go eat a picnic in the parking lot for dinner. 7. For kiddie rides. I LOVE amusement parks and all of the huge roller coasters. I love that feeling of my stomach dropping and waiting in line for two hours for a two minute ride that you can scream your lungs out on. I love it. I love waiting in line with friends and making fun of all of the teenage couples who can't keep their hands off of each other even though it's 100 degrees out. I'm like, "Please.....get your hands off of me--it's hot, I'm sticky, and I feel like a big sweaty mess." But............yesterday I gained a new appreciation for the kiddie rides. That tucked away little corner of the amusement park that's probably a punishment if you're a ride operator--but it's great. Georgia was in her glory. We were a little worried she'd be her typical wary self and not want to try anything but we were dead wrong. 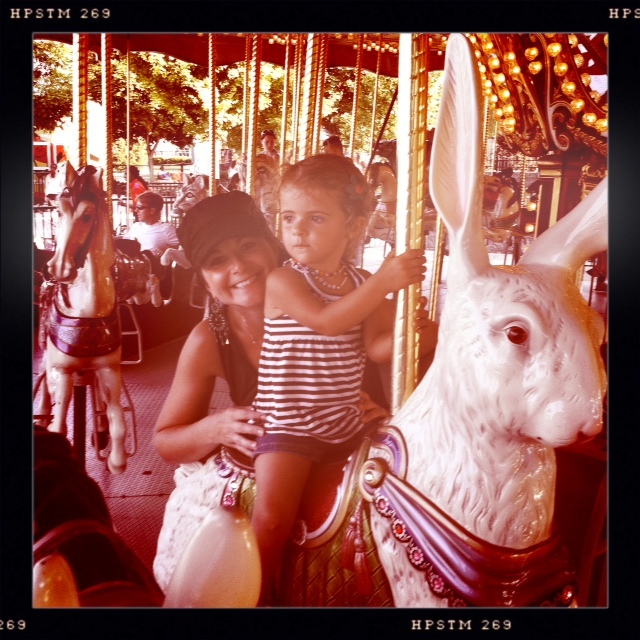 She wanted to ride everything over and over. We even took her on the log run (it's a pretty good hill) and even though she said it "scared me a little bit" she cried when we told her it was the last ride and we had to go home. 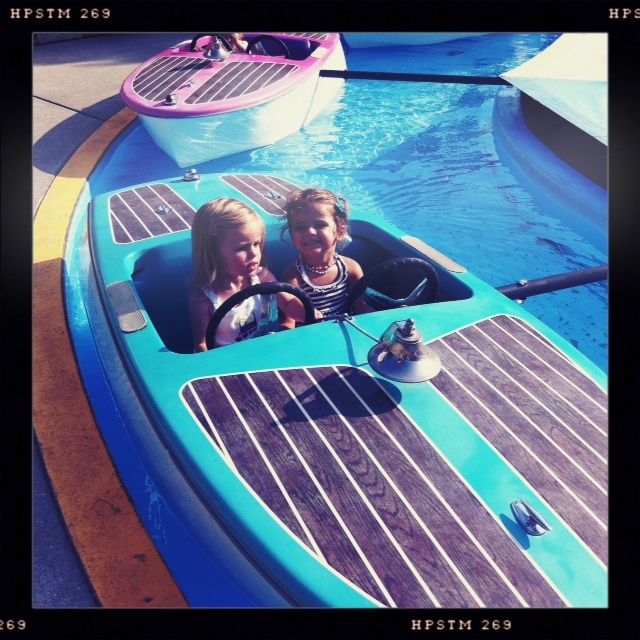 It made me so happy to watch her little beaming face as she rode the whales, the cars, the boats, and the carousels. Even happier than when I roar down the hill of the Raging Bull at Six Flags. 8. For good friends and great kids. Another hard thing about infertility (for me) besides the obvious was that I felt like we were constantly getting left behind. All of our friends had kids. With kids comes kid activities like parades, and playgrounds, and soccer games, and amusement park days like we had yesterday. People with kids always assume that if there is a couple that doesn't have kids they won't want to come to that kind of "stuff" so they don't ask them along. It's not ill-intentioned, and now that I have a kid of my own who whines and cries sometimes and interrupts conversations and doesn't want to walk fast I get why you might think, "who wants to be around this all day if they don't have to?" But, it's hard. I wanted that relationship with another family. I wanted a level of comfort with their kids that they'd stay with me and do what they were supposed to do while their mom took care of something else. I wanted them to ask me to help them tie their shoe and not only think their mom could help them. 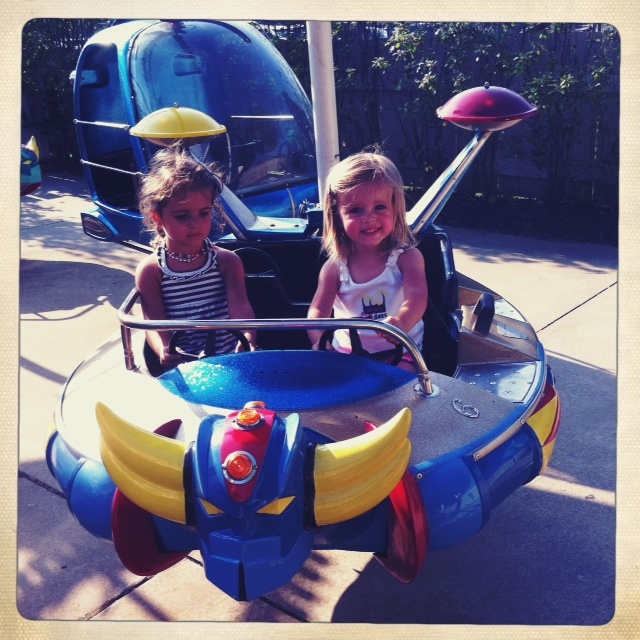 I wanted them to want to ride a ride with me. And I wanted my child to feel the same way about someone else. I wanted my child to run around and chase other kids, tackle each other, want to be near other kids because she felt so comfortable with them. I wanted my child to ask if so and so's mom and dad were going to be there because she liked them. At the end of the night last night our friends little girl Madi gave me a hug, totally unprompted, while we were waiting for the tiny girls to get off of a ride. She said she was tired and thanked me for letting her sit in our log on the log ride. It meant the world to me. I'm so thankful for these friends of ours, the Hammonds, and that there is this level of comfort where our kids can hang out and play and almost annoy each other sometimes but love each other all at the same time and I'm thankful for their parents who are so fun to be with, so easy to be with, and so valuable to be with--they are great friends. i love that picture of Chris and G where she is looking at him! So cute. Miss you and LOVE you. Thank-you for turning on the fireworks.